I love it when a book strikes the right balance between factual research and drama, and this is one of those books. In a solid and confident effort, D.J. Kelly brings to life the story of Constable William Mitchell, a regular man who finds himself on trial for the murder of a magistrate. Various chapters illustrate the life of Mitchell, from a young age to his life as a soldier. Beautifully fleshed out and spiked with fascinating details and facts, her narrative oozes authority and credibility while the drama provides enough hooks to get drawn in on an emotional level as well. I knew little about this part of Irish history and feel I come away fromt he novel educated and entertained. Kelly’s writing is eloquent and smooth and makes this a real treat. Manchester-born author DJ Kelly took early retirement in 2010 from a career which had enabled her to work and play in 20+ countries across 4 continents and to learn a number of European languages. 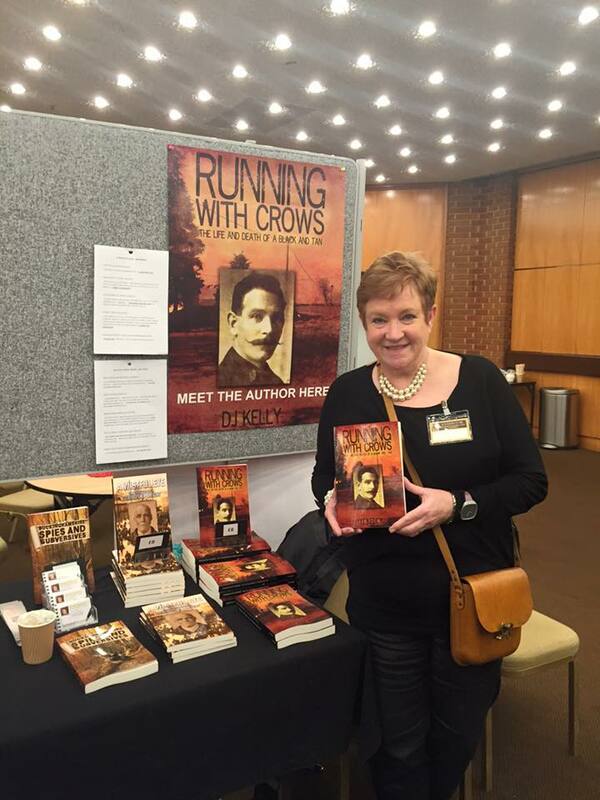 She writes novels (historical fiction/docu-fiction), short stories and articles. 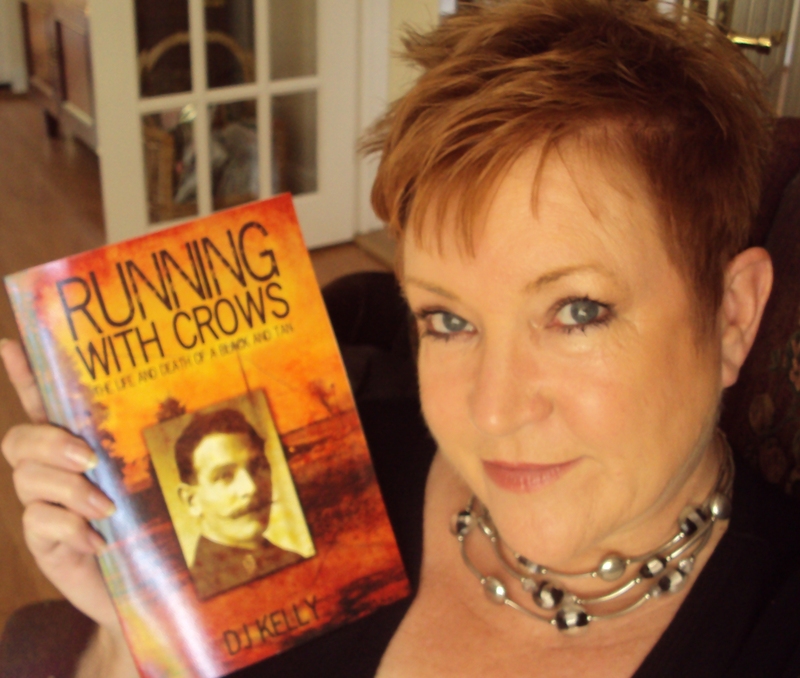 She was commissioned by an award winning theatre company to adapt one of her novels – ‘Running with Crows – The Life and Death of a Black and Tan’ – to a 3 act play which is to be performed in spring 2015. She is married and she and her husband live in the Chilterns. Having occasionally strutted the stage, including a brief and happy time as a member of RATS (Rawalpindi Amateur Theatrical Society), and having variously been a member of The Creative Writers Network of Northern Ireland and Metroland Poets, she founded and co-ordinates Chalfont Writers’Circle, a support network for authors in South Buckinghamshire. She also has a lot of fun these days with Chesham Scribblers. Her skills and interests lie in research (historical and family history) and investigation (if there’s a skeleton in the closet, the odds are she’ll find it!) and she enjoys reading, singing, swimming and travelling. Thank you, Christophe, for this lovely insightful review. Thanks for yet another introduction! I love that you are so generous in bringing us talented authors.